Note: This subscription service is intended for Philippine-based subscribers only. Please fill out and verify your contact information below to renew your one-year subscription to the Beyond Today (formerly The Good News) magazine absolutely FREE of charge. You will need to enter the 10-digit Subscriber PIN assigned to you. 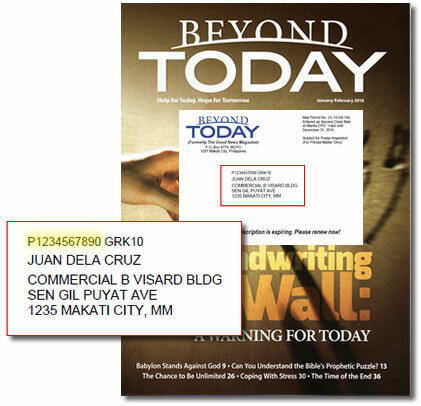 Entering your Subscriber PIN assists us in renewing your Beyond Today magazine subscription. Your Subscriber PIN (starting with a 'P') can be found in the address section of your BT magazine mailing label. In the example below, the Subscriber PIN (highlighted in yellow) is 'P1234567890'.